Here are 40 sentences to rewrite, PET level but useful even if not preparing for this exam. They are NOT a compilation from any book. They revise quantifiers, relative clauses, indirect questions, comparative and superlative adj., reported speech, passive voice, causative have...among other things. KEY INCLUDED ! Enjoy ! 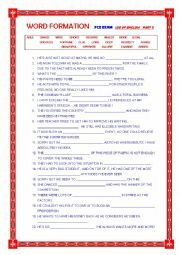 Here are 50 sentences which sts have to rewrite. 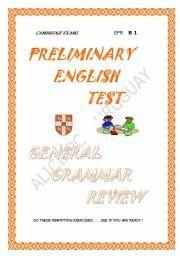 I´ve tried to include the main grammar points checked when taking FCE, but it´s good practise for any advanced level group. WITH KEY ! Have a nice Sunday! 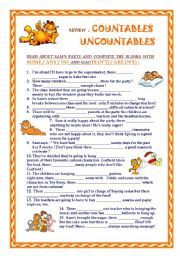 This ws has some pics for ss to complete using the correct future tense. In case anyone needs the answers: 1,3,4,6,7 and 9 are "will", the rest, "going to". 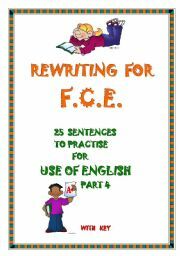 And to complete below the situations in which to use one or the other : "going to" is for E and F, the rest, "will". Thank you lizsantiago for the template ! Have a good week ! 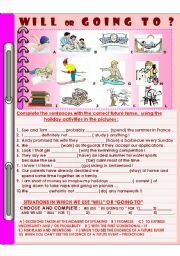 Simple ws to complete with the correct form of to be, to have and can. Sts have to answer some questions as well. Editable. 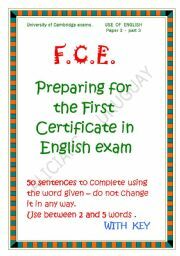 Classes will begin shortly here, so I´ve prepared a summary of the FCE content. 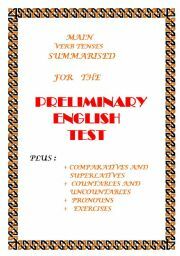 It is a detailed description of 30 points I consider important for sts to master before they take the exam. The idea is for sts to use this summary and "tick" points as they learn them ... just a thought. I hope it is useful for you too! Have a nice beginning of week ! 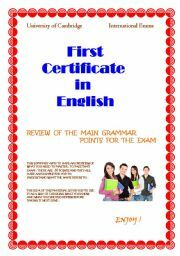 This is a summary of the main grammar points, PET level. It includes the items you can read on this page and exercises. 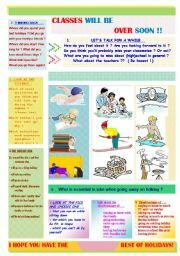 I hope it is useful for your sts! 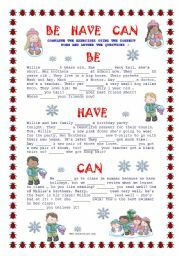 Classes will be over soon in some countries(not here, we have 6 more months to go...) so I thought it would be nice for teachers to have a ws to get sts talking about holidays... I hope it is useful ... it will be for me in November !! :-) Thank you Jelena for the nice template !